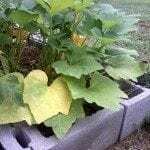 CAN YOU TRAIN YELLOW CROOK NECK SQUASH TO GROW ON TRELLIS OR FENCE INSTEAD OF RUNNING ON GROUND? Yes! Make sure your trellis is sturdy!